Mörka och ljusa drömmar (Light and dark dreams) by Ellerström & Kinnander is a work dedicated to the memory of widely translated Estonian-Swedish author, artist and musician Mare Kandre (1962-2005). After having curated a posthumous exhibition of her paintings and drawings, and edited an album of her graphic punk stories, Jonas Ellerström asked Olle Schedin, member of Kandre's band the Global Infantilists, to provide him and his musical partner Göran Kinnander with chord progressions and melodies for some Global Infantilists songs. 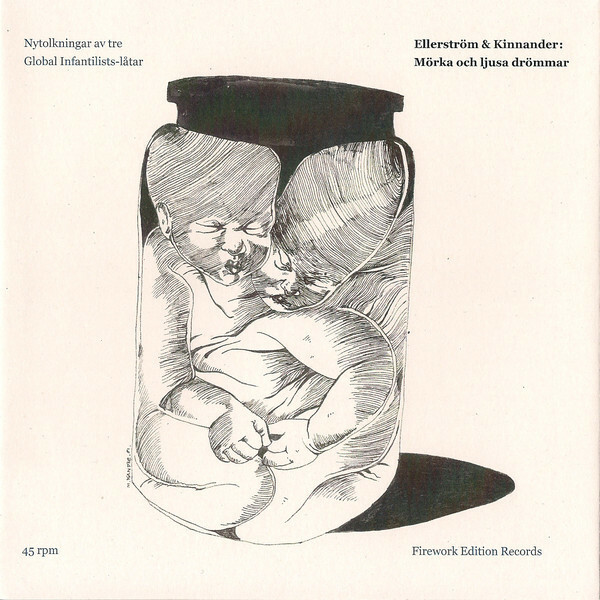 New songs (rather than versions of the old ones) were created from this material, Ellerström playing bass and acoustic guitar and Kinnander playing synthesizers and being responsible for various sonic treatments. 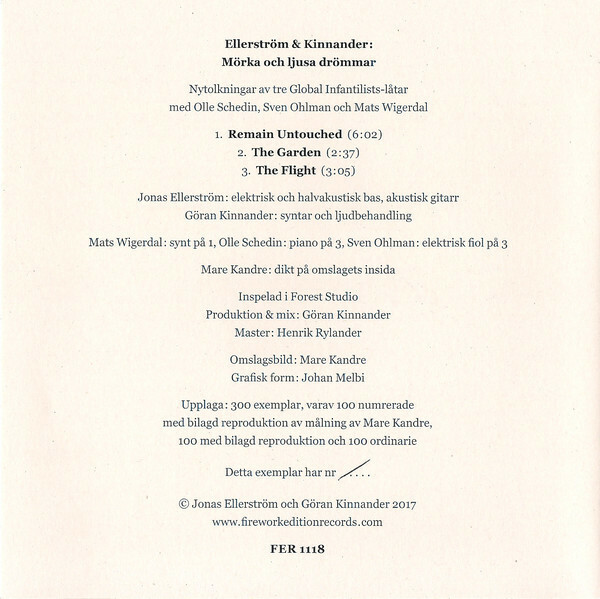 Finally, the three remaining members of the Global Infantilists (since Kandre's tragic death in 2005), Olle Schedin, Mats Wigerdal and Sven Ohlman, were called upon to add overdubs to the recordings. Naturally, no one was to take Mare Kandre's place as vocalist. The result is a suite of three haunting soundscapes, remnants of the original melody lines interacting with newly created ones on top of a mood set by the subtly dramatic chord changes. The post-punk songs of the Global Infantilists have become up-to-date electronica, sadness, longing and an ethereal beauty reverberating all through these three recordings: "Remain Untouched", "The Garden" and "The Flight". The 45 rpm, vinyl EP package comes with an inedited cover drawing by Kandre, originally done for the band's first of two albums.